Last year at this time I was closing out a week of being alone. My job had kept me from traveling with my family. I was an entry level employee at PSAV. That was the job I had taken to help make ends meet before my main freelance gig went up in flames. At that point it became my main source of income. In case you think that AV companies pay well, let me tell you… they don’t. Especially jobs that are entry level. What I needed was a job that paid enough to live on and still left enough time to pursue the dreams I had. You see, back in 2011 I had a good paying job. Except that job was a position that requires a calling. And God has altered my calling. Prior to that I was happy and fulfilled to work as much as required to fulfill the work of the ministry position I was in. But God began to move. And I was allowed to do something I know God put in my heart for a year before I needed to get another “real” job. I was proud of what we accomplished on the show Peculiar, and happy to have that work recognized. I was disappointed in the financial success of the show, and wish it had been something that could have been self-sustaining. Happily, financial success isn’t the only kind. Back to January 2014. I was working full time, with great benefits and not much pay, in a job I was very overqualified for. So, I set about moving up the ladder. Within just a few months I was promoted twice. Once to the “show team” where I got paid a bit more and either worked over 70 hours a week, or under 20. Then I was promoted to middle management. Still a tech, but now running a small team with much more predictable hours. And still not getting paid enough to live. It would be another year before I would be eligible for another promotion. God wasn’t absent during this time. We didn’t know what was going on, but he did. We felt like we should sell our house... so we did. And it sold within a week. We had nowhere to go. Except to move in with family. If you ever want to feel humble, move your family of 5 in with your in-laws. Meanwhile, the concerns of supporting a family weighed heavily on me, and dreams took a back seat. We began praying and looking for other work. We trusted God. I worked to find time to follow my dream. But never did shoot a project. Eventually, we opened up the job search to there placed and even ministry jobs. We had gone all the way through one interview process earlier in the year, but God hadn’t given us a peace about moving then. Yet here we were a few months later, actively seeking a new job, anywhere. I spent the Summer searching for a new ministry job. I talked to some places, but nothing was working out. I felt like I could work in a ministry job again, but didn’t feel like I was called to lead a large media ministry anymore. I still felt called to create biblically based media. But my education and experience were in traditional media ministry. I was searching for a position in a media ministry that would allow me to earn a living, do what i was trained for, and still have time to pursue what I was called to do. My new ministry position allows me to get paid to create visual content for the church. Arguably, this job alone allows me to do what God has called me to do. But, I also want to create a community of believers who develop and produce video and films from a biblical worldview. I’ve still got scripts to shoot, and write. I’ve got stories to tell. This has been a hard year, but one in which we continued to see God provide and lead. I am excited to see what 2015 holds! The WordPress.com stats helper monkeys prepared a 2014 annual report for this blog. Some of my old how to tech posts are still popular. We just had tile installed in our house. It’s been a learning experience, and you can benefit from it. Like many people, we were attracted to the low interest rates for financing a large flooring purchase that these stores offer. Does the installer measured space match the space on the quote? At one point a sales guy had plugged in 200 square feet on our quote as a place holder. In reality it was closer to 900. When I caught that mistake, the cost jumped way up. What labor is in the quote? 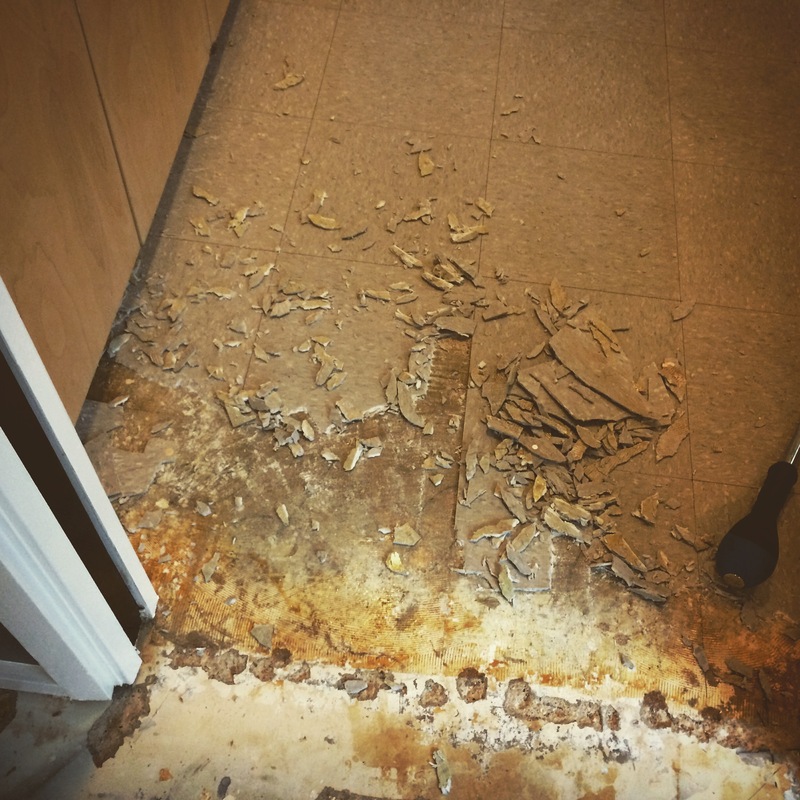 Are you expected to remove the existing flooring? Is the installer sealing the grout (If applicable)? 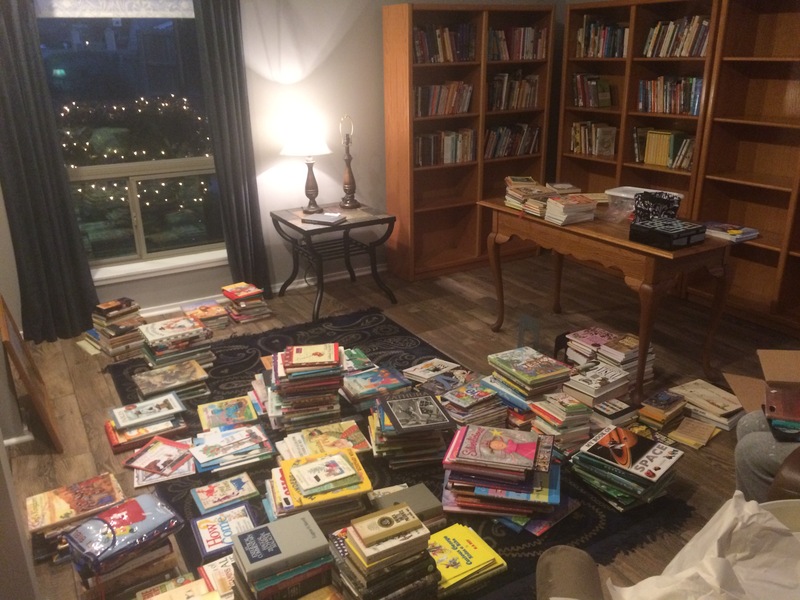 We saved a lot of money by removing our old flooring. But we also thought we had paid for the grout to be sealed. I’m finishing that today. We were told we didn’t need to remove the old vinyl tile, but in the end we did, and that cost more. Are all the products in the quote correct? I know, simple question, but instead of the dark gray grout we ordered, we had light tan grout delivered. Is everything you need in the quote? We had to go buy some transition pieces that were not included. When will the flooring be delivered? How long until you have it on hand. You do not want to wait to get it. Our store had a miscommunication and did not deliver the flooring until I called about it. When will it be installed? Our store promised before Christmas, and it was. But finishing and curing on Christmas Eve doesn’t leave a lot of time to move the furniture in. In the sales process we heard installed within a couple weeks, but in reality it was over a month. Speak to the install office to find out what a real estimate is. Once installed, how long until you can move your things back in? 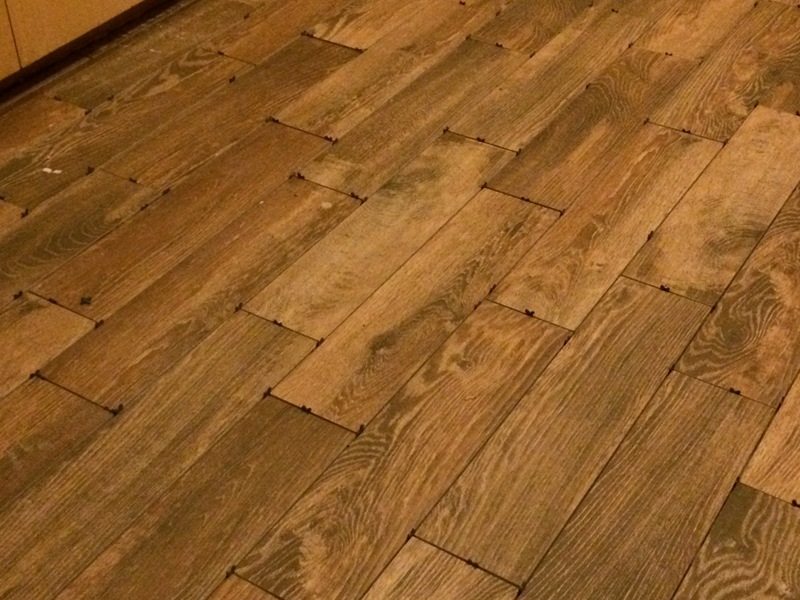 Flooring, like tile, may take some time to set and cure. The install may be done, but you may not have access to your space until 48 hours later. Is that the best they can do on the price? Let’s face it, this is a big ticket item. No harm in haggling a bit. There’s wiggle room in the that bottom line. How will warranty items be handled? The installer pointed out two tiles that have to be replaced. We’ve seen some grout that needs to be reworked in one area. How does your store handle those issues? Do you call them or the installer directly? Hopefully the answers to these questions will help you enjoy the process as much as you will enjoy the finished product. We love our floor. And we love finally being done with the install. One of the drawbacks of older homes is smaller door openings. In a new construction home you will likely have a door that’s 34″ wide, but in a home like our 1974 Modern we have interior doors that are closer to 32″. 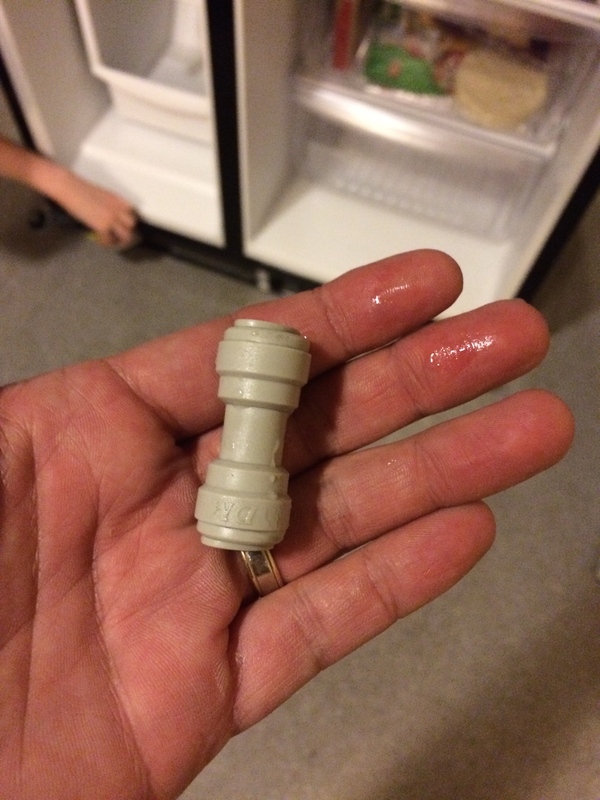 And those 2″ really matter when you are moving large appliances. It’s finally time to have the tile installed. (More on that later) In order to do it right, we moved the stove and refrigerator out of the kitchen. Stove ended up in the laundry room. But the fridge needed to be moved to the entryway. 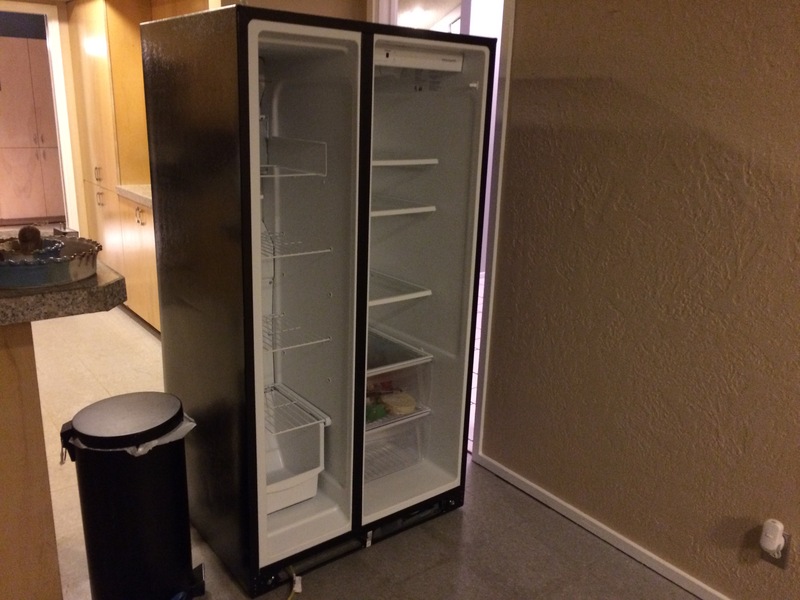 With the handles off, our fridge is 33″ deep. That means it won’t fit through the 32″ doors in our home. First, turn off the water, unhook and drain the water line to the ice maker. If you are ready to do the move, go ahead an empty the fridge out. Make sure to remove the ice in the freezer. If you work efficiently, you should be able to put it all back and save the food from spoiling. Remove the bottom cover on the front of the unit. It should just snap off. So, for most of these, the door sits down into the bottom hinge, and the top hinge drops into a hole on the top of the door. The door with the water line has more steps, but one door will be easy to remove. Break out the socket set and screw drivers. Take off the covers on the hinges. Take out the screws holding the top hinge on. The door should stay closed, but be careful in case it shifts. 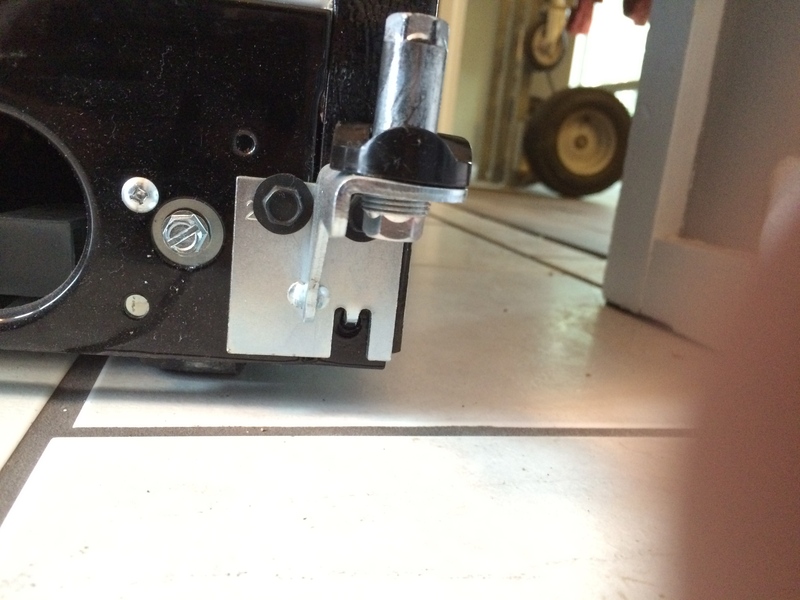 Remove the hinge, open the door a couple of inches and lift it free of the bottom hinge. Then remove the bottom hinge. Keep your screws with the proper hinges. Now, the door with water access. When you remove this hinge cover on top, you will likely see a ground wire and a bundle of wires coming from the main part of the fridge into the door. Unplug the wires and remove the screw holding the ground. 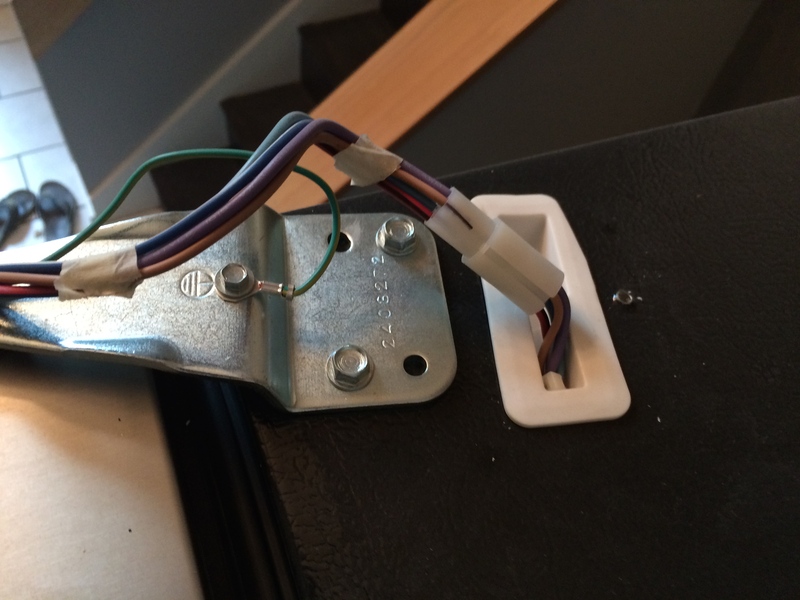 Remove the top hinge, and carefully pull the harness and ground wire through the hinge. When removed, it should look like the images to the left. Stop, don’t lift that door yet. The water is still attached. On my fridge, it was coming in through the bottom hinge. The plastic tubing for my unit was attached using a coupler pictured to the right. It’s designed to hold together even when it’s pulled apart. To get them apart, you need to push in on a small ring and slide the tubing out. Then as you lift up the door, the tubing should feed out of the bottom hinge. Next, remove that hinge like you did on the other side. At this point, both doors are off and you are ready to move the appliance through the narrow opening. Be careful, there is still not much room. We used a two wheel dolly. If youdon’t have straps, you should have a 2nd person to help. Do not tip the fridge over on its side. To reassemble, just reverse the process. We didn’t hook the water line back up or replace the top hinge covers because we will be moving it back in just a couple of days. The fridge is plugged in and cooling in the entryway while the tile goes in. I’ll be taking the doors off one more time to get it back in place. Remodeling, Unexpected Costs and Customer Service. I’ve been posting some about our experiences doing some remodeling on our 1974 Modern style home. The day after we bough our house I ordered tile for most of the downstairs. It’s a faux wood tile that will be in the both living areas, the dining room and the kitchen. Over 900 square feet of tile. That’s a big job. There are always unexpected costs in any remodel. Watch any two episodes of any HGTV show and at least one will have a remodeling project that finds something during the demo. In order to save money, I removed the old flooring myself. I even posted a video about how to rip out old laminate wood flooring. Under that flooring was an old vinyl tile. I went to the store and spoke with them. Did I have to scrape that flooring up or not? They assured me that the installer could install right over it. OK, reassured, I didn’t worry about it anymore. Here at the end of the year, the install wait time was significant. But we are on track to get it all done by Christmas. Over a month after I purchased the flooring. About the middle of December The installer called to see if they could come install my floor early. I was happy to have them do it, but the store had not delivered my tile yet. So we lost that window of opportunity. My product was in the back room at the store, but no one had delivered it yet. I got on the phone and had 2 pallets of tile at my house the next day. Then comes this morning. The installer arrives and we begin talking about the job. He is surprised to see the vinyl tile. He is concerned, and calls the manufacturer to make sure they can install over it. He is told they should not. The install department of the store says he should not. Now there is more labor cost. Remember, I removed the old flooring to save money. I asked about this flooring, and was told I could leave it. One person even said I should leave it. Now I’m looking down the barrel of several hundred dollars in labor and haul away of vinyl tile. I was not pleased. The installer and I talked. He called the store. It was going to cost $300 to remove this old tile. He had dropped the price over 50% of what they normally charge of this much removal. By my reckoning the store had missed 2 opportunities to keep me from eating this expense. First their employees had told me it could be left, so I had not spent any of the last 3+ weeks removing the old tile. Second, if they had delivered my product on time, the installer would have seen the old tile over a week ago, and I could have removed it myself before the original install date. Instead, I was faced with an additional $300 bill in order to get my flooring installed before Christmas. I’m not unreasonable, and this price was better than expected. But I was not happy about eating the whole thing. I did not want to hold off and have that for installed later. Living a month without being able to fully move in has been hard. So, off I go to the store. I find those kind of conversations are best had in person. Because the store knew I had not only purchased a lot of flooring already, but will be doing some more improvements in the coming months, the employee had already spoken to the manager. I arrived, we spoke about the issues, and missed opportunities the store had to keep me from facing an unexpected expense. They offered to cover half the cost. That means I will pay $150 to have 400 square feet of vinyl tile scraped up and hauled away. I could have done this myself, but in order to get it finished on schedule, I was willing to meet them halfway. In reality, I would have paid the whole $300, but it would likely have been the last money I would pay them on a large install. Because they owned up to their mistakes, and were willing to cover some of the costs, They kept a customer. Yes, I will spend a bit more than expected, but nowhere near the amount it could have been. I think that’s why Christmas became more popular than Easter. That and free stuff under a fir tree. Christmas and the image of baby Jesus are non threatening. Sure, we sing carols about how a King was born, but even a nominal Christmas/Easter church attender knows that he wasn’t a “real” king, he doesn’t have armies and a castle of stone with a moat. Jesus in the manger doesn’t make people uncomfortable. He is a cute baby in swaddling clothes. So warm and cuddly. Jesus on the cross isn’t like that. That’s where he took the pain we deserved. It gets personal. Being born, that’s cute. Let’s eat cookies and sing carols. Being whipped to a bloody pulp and nailed to a tree to hang until you die, then turning the world upside down by coming back to life… all so you and I could once again be reconciled to the creator of the universe… Well, that’s a bit more. It’s not safe. It requires a reaction from us. 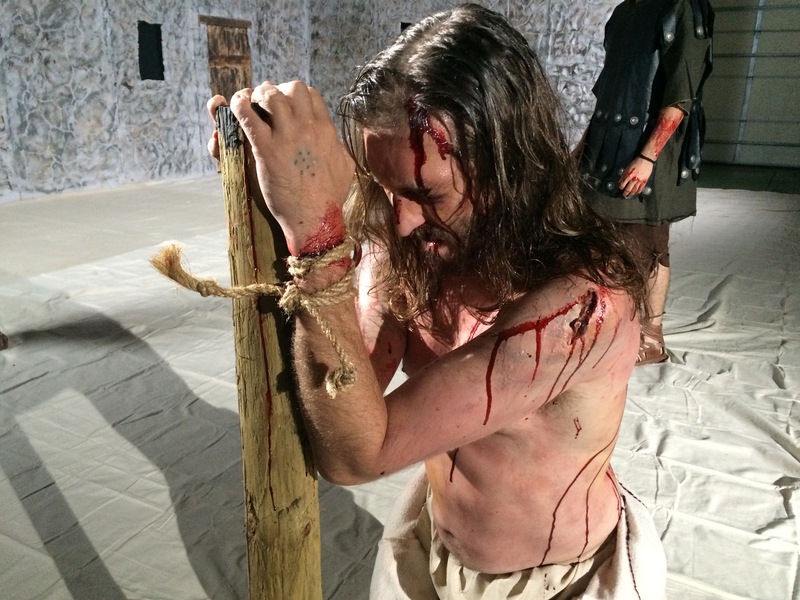 So I can understand why some people could have been disturbed by the depiction of Jesus on the cross, Jesus being whipped, bloody and hurting Jesus, in our recent Christmas production. Don’t get me wrong, it’s not “Passion of the Christ” level of blood and violence. It’s more TVPG violence. I felt comfortable having my sheltered, homeschooled 9 year old watch. I had my 6 year old close her eyes. We didn’t have the skill, time or budget to really recreate the horrible violence Jesus Christ suffered for each of us. We did a good job with what we had, and I was pleased with the final result of the footage. It’s took almost 2 hours to get the makeup done for the scourging scene. This cross scene is some of the most powerful imagery I’ve ever shot. Lots of churches stop the story at Christmas with the wise men bringing their gifts. And I don’t fault them for it. That is the story of Christmas. Other churches tell the entire life of Christ. Because Jesus didn’t just stay a toddler getting some gifts from the Magi. He had a greater purpose. When sharing the gospel in Christmas productions you can talk about that purpose, or you can show it. We chose to show it. I’ve been to a lot of church productions that put a guy in white shorts/loin cloth on a cross and we pretend that’s what Jesus looked like. It’s not. A cursory read of the biblical accounts would show you that’s wrong. A closer, more in depth look at the torture and execution methods of the day would shed more light on the gruesome visage of our savior, willingly dying on a cross for us. I think people who are upset by violent reminders of what the Lord went through for us are mostly upset by being reminded of it, not about seeing it. I was “disturbed” by scenes of Mary in labor. My first reaction was that I wished we hadn’t included that. When I stopped to think about it, I realized it was because I don’t really think about the fact that Mary had a normal child birth for the time. It was the immaculate conception, not immaculate delivery. It made me uncomfortable. People don’t want to come to a Christmas show to be made uncomfortable. They want the warm feelings and carols. But the story of Christ doesn’t stop at the manger, it ends with an empty tomb. The path from manger to tomb is disturbing. If we choose to show it, then we must choose to do so as accurately as we can. That means there will be some disturbing images, not for the sake of showing violence, but to remind us of what our salvation cost. Remember all those production posts with pics from on set? Well, the time is finally here to see it all come together. I’ve been away. I’ve been busy. It’s not you, it’s me. Seriously, it’s not either us. It’s Christmas church production time. This, combined with unpacking from the move, hasn’t left much time to write or work on other projects. On the house, painting upstairs is done. I finished pulling up tack strips in prep for the tile to go down. But that is not happening until very late this year. Weekend before Christmas, if you can believe it. I’m hoping there is a cancelation and our install date moves up. Meanwhile, we are settling in as best we can, knowing the entire downstairs cannot be unpacked and set up until the tile is laid. This will slow down again and I will give more detailed updates on our house project, film projects and life in general.